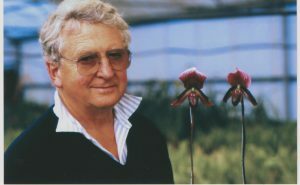 Since the late 1970’s Roelie van Rooyen had been very busy in the Lab producing a variety of different offspring. This can be seen in the almost 2000 seedpods sown in the Van Rooyen Lab up to 2007. Some of these are selfings or siblings of specially selected species while others are brand new hybrids. As is always the case not all of these crosses have germinated and some don’t make it further than the seedling table. Some have been a roaring success and others quite disappointing, but all-in-all this has been a very worthwhile learning experience. It has taken some time to go through all the old records (and a few missing ones that still haven’t turned up), to try and start a small data base of crosses made at Van Rooyen Orchids. Following is the third draft of hybrids made at Van Rooyen orchids with information available at this time.